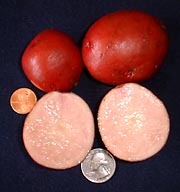 The All Red potato has brilliant red skin and pinkish-red flesh. Smooth sin, shallow eyes. Round and red inside and out. it’s gonna be very popular in potato salads and potato pizzas along with All Blue, Yellow Finn and Anoka.